Recently, I've been spending some time in Shenandoah National Park and at the beginning of this month I had the privilege of witnessing some truly remarkable events. However, before I get too deep into this post, I should make the following disclaimer: If you do not believe, as I do, that natural predator/prey interactions have their own inherent beauty and majesty (despite being sometimes gory or even sad), or if you believe that no harm should ever befall cute and cuddly animals, this may not be the best post for you; feel free to skip this one. Now that I've gotten that out of the way, the morning started out as a pretty standard trip to Shenandoah. I started out the morning at several overlooks south of Thornton Gap, looking for a good place to photograph the twilight and sunrise. However, on this morning the overcast and intermittent rain never lifted enough to provide much of a light show. I headed next to Big Meadows to look for white-tailed deer (Odocoileus virginianus) fawns either feeding with their mothers, or better yet bedded down for the day. 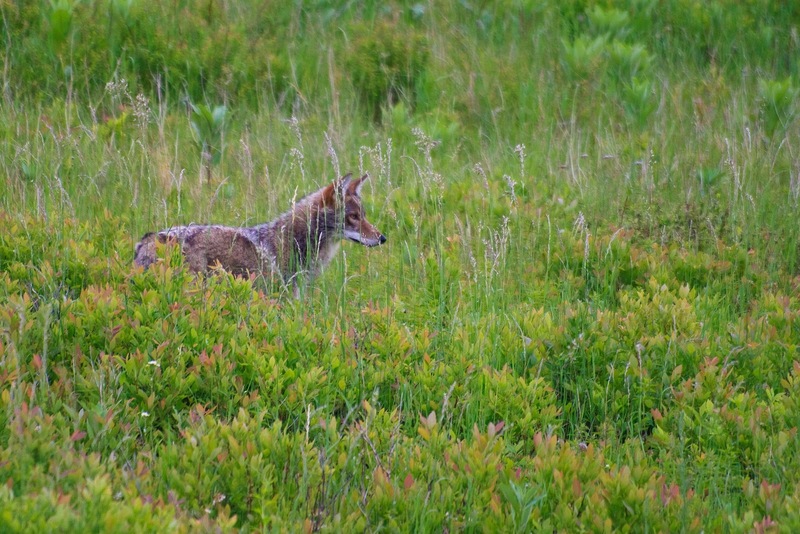 However, I was not the only one with that idea, when I arrived at the meadow a coyote (Canis latrans) was actively hunting fawns bedded on the meadow (I feel like the wolf theme from Peter and The Wolf should be playing at this moment). 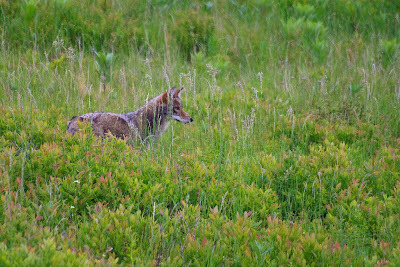 I personally watched (and heard) this coyote locate and kill at least three fawns that were bedded down in the brush. It seemed to be actively hunting and not eating, so it would make a kill and then move on (presumably to come back later as I saw it do in at least one instance). There were still many does and even some fawns moving throughout the meadow. I have to apologize for the next two images. They are not at all up to the standard I usually require for posting, but they are such cool behavior shots that I couldn't possibly not post them. 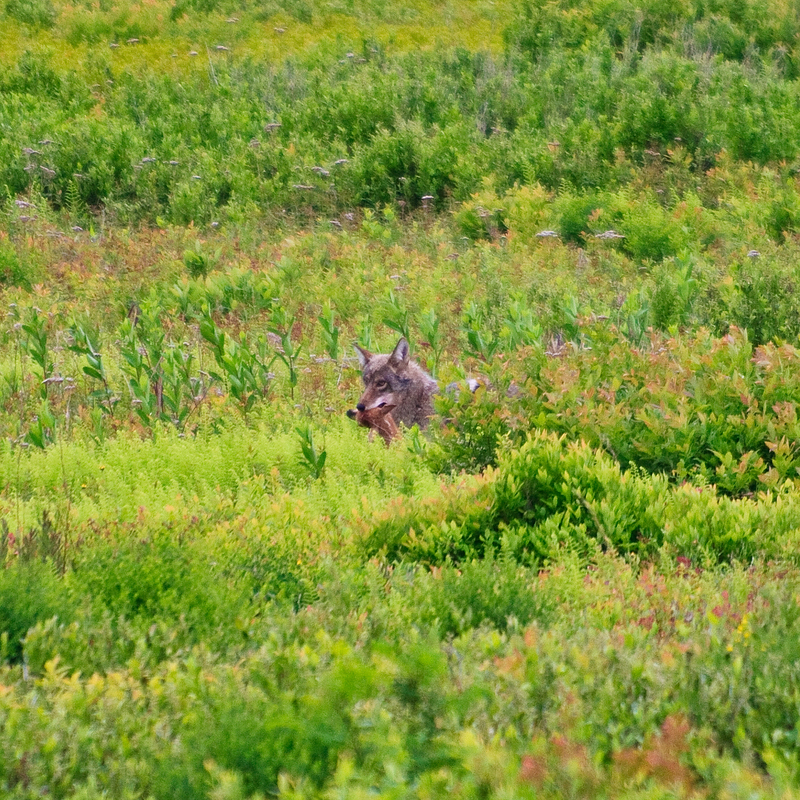 Here is an image of the coyote just after making its third kill (yes, that is the head of a fawn clasped in its jaws). 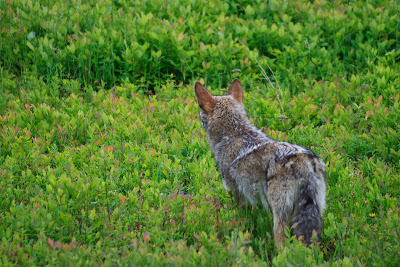 After leaving the coyote, I skirted around the edge of meadow looking for bedded fawns (any that were left at any rate). Unsuccessful at that endeavor, I headed down towards the center of the meadow and I spotted a doe and fawn down near a wet area at the bottom of the meadow. I saw the doe "drop" (tell it to hide) the fawn in the underbrush, but the doe didn't leave. It seemed to be very agitated; jumping, stamping, and running back and forth, but not oriented towards me. That was when I saw the coyote nearby on the other side of a thin stand of alder. The coyote (presumably the same one since I never saw more than one out on the meadow) had obviously stalked the doe and fawn and was moving in for the kill. But then something unexpected happened. The coyote came around the stand of alder and the doe charged it. The coyote took off running with the doe bearing down on it rapidly. It all happened so fast (and so close) that I barely had time to react and get off a couple of shots. This is the best. I'm not sure if the doe actually connected with the coyote, but if not, she almost did. Then she was past it and the coyote started chasing her. 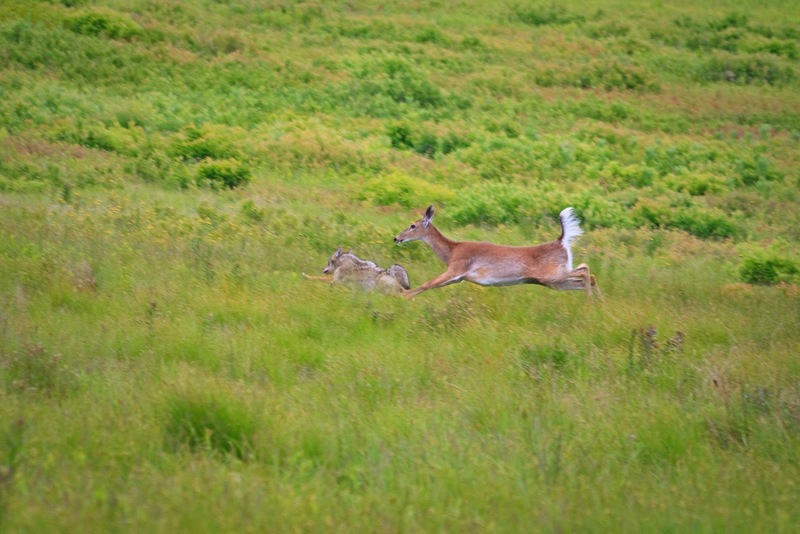 But it was no match for her speed and it soon gave up and wandered away, completely forgetting about the bedded fawn. No doubt that this doe would be a strong contender for mother-of-the-year. After some more unsuccessful searching for bedded fawns, I was returning to my car when I noticed the coyote was back feeding on one of its previous kills. I was able to slowly approach and get some images of it feeding. Then finally as I was just coming off the meadow (and about to my car) I was almost run down by a doe and fawn running along the path (perhaps escaping from the coyote or perhaps the doe thought I would keep the coyote at bay). 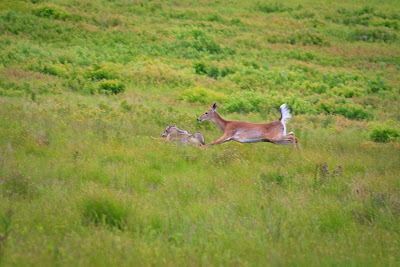 The doe eventually continued past me, but the fawn kept coming closer, but was too shy to pass me. I was able to get several images of it bleating for its mother (which was just past me near the road) before it ran off in a different direction to bed down near the edge of the woods. Unfortunately, at that point I had to bring my promised half-day trip to an end, but I felt very privileged to have witnessed such an amazing wildlife spectacle. Fascinating. I have personally had many encounters at Shenandoah with wildlife, among them a close encounter with a black bear,yet I haven't seen a single coyote. I am surprised you saw him in Big Meadows. I guess he much like the deer are used to the close proximity of humans. Great read Elijah. Maybe we will cross paths in Shenandoah one day. Thanks for the comments John. 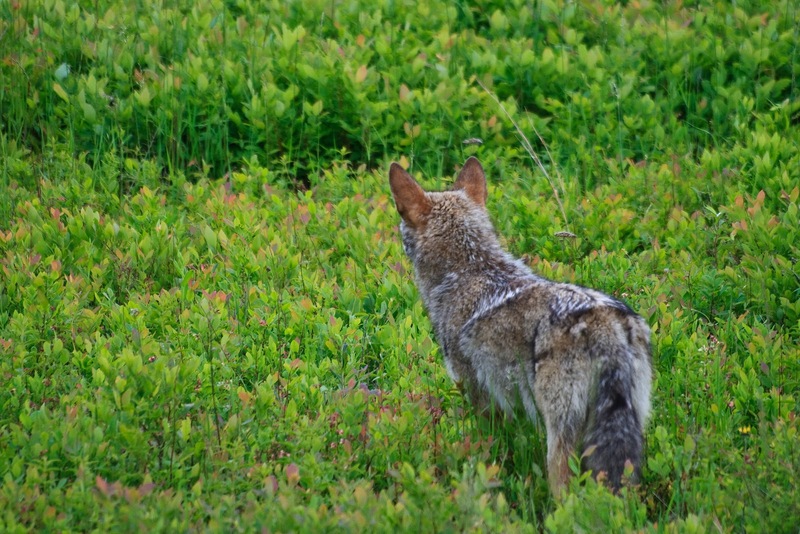 Apparently the coyotes really starting showing up obviously in Big Meadows starting in 2010. This was the first time I had seen them. But given the abundance of deer, I'm not too surprised. I caught a glimpse of another one about to the cross the road just south of Big Meadows this past Thursday. Always an honor to witness the rawness of life..great post..Especially love the blue on blue mountains! The other night, I was at Gooney Run overlook and I heard many coyotes I would guess killing a large deer. It was an amazing racket. It started as one howl but then the group all went super vocal. You could hear the sound of the "pecking order" ... I will never forget it. I also saw a great shooting star and one of the best views of the Milky Way I've seen at the same time!